Philip Gaimon got the best possible start to his professional career when he won yesterday's opening stage of the Tour de San Luis, his fist race with the Garmin-Sharp team. Having denied the sprinters a chance to shine on the flat stage, the American said that the team planned to capitalize on the fact that the major teams didn't know him at all. After riding on continental and amateur teams in the USA for several years, Philip Gaimon has got his chance at the WorldTour level in 2014. Right from the beginning, he showed his Garmin-Sharp team that they did right by picking him up when he won the opening stage of the Tour de San Luis from a breakaway. Gaimon made it into the day's long break with Leandro Messineo (San Luis Somos Todos), Emiliano Contreras (Argentina), Julian Gaday (Buenos Aires Provincia) and Marc De Maar (UnitedHealthcare) and was the last man standing. Gaday was dropped after securing the lead in the sprints classification and De Maar and Messineo crashed out of the group with less than 20km to go. This left just Gaimon and Contreras to battle for the win and the American was able to distance his companion in the finale. 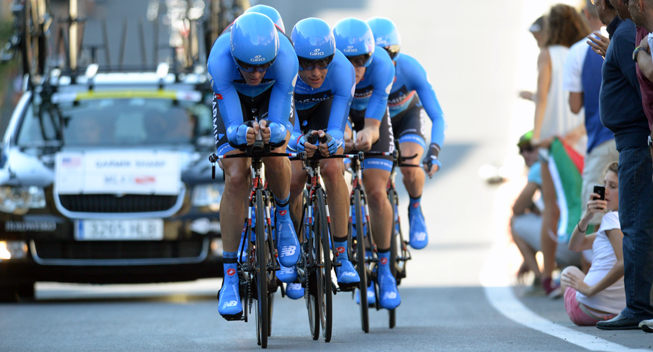 The stage was expected to suit the sprinters but as Omega Pharma-Quick Step got no help, they decided to stop the chase. Gaimon benefited from that and he admits that he tried to capitalize on his status as an unknown neo-professional. "The team said if I get in the break, nobody knows who the hell I am and we might get lucky," he told Cyclingnews at the finish. "Chann [McRae, sports director] thought it might be work for me to go in the break because the big teams don't know who I am," he added. "That plan worked like a charm. Never in my wildest dreams would have thought that I would be wearing the yellow jersey here. Unless I wake up and everything is a dream, a la the Wizard of Oz, I will fight to bring it home for the team. I want to thank my teammates and Chann and JV [Jonathan Vaughters, team manager] for giving me the opportunity to do what I did today and for believing in me." Gaimon actually caused the crash that took De Maar and Messineo out of contention. Entering a roundabout, he made a mental error as to which road to exit from and caused his companions to hit the deck. Afterwards, he was very apologetic. "That was unfortunate and not a great way to win a bike race," he said. "I already apologised to Marc [De Maar] immediately [afterwards], but the end result was good and I'm happy to see what the rest of the week holds." Originally, the team was in the race to support Tyler Farrar in the sprints and Tom Danielson and Janier Acevedo in the GC. However, Gaimon is no bad climber as he proved when he finished 2nd in the Tour of the Gila and with an advantage of more than 4 minutes over the favourites, he may have a shot at overall victory. "I haven't discussed the plan with the team yet, I don't know what the gaps are, but I would love to hold on to it," he said. If not, we have one of the best sprinters here and we've got some of the best climbers here so the team has a lot of options still." Sports director Chann McRae was impressed by his new rider. "Phil rode with the heart of a warrior," he said. "He was able to handle his hydration and level of effort and still had something left in the end. Phil's companion couldn't respond when he attacked with 2km to go and he put down his head and went all the way to the finish line. Today's win was a great start to 2014 for the whole team. " Gaimon will face his first big challenge in today's second stage which ends on the Mirador del Potrero climb.